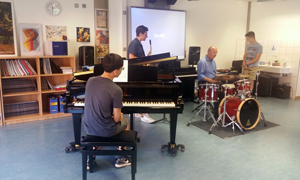 On Monday, May 29, Dr. James Ketterer, Dean of International Studies at Bard College (NY) and professional drummer with 'The Arch Stanton Quartet' (www.archstantonjazz.com) gave a masterclass on the art of jazz and its relationship to international diplomacy to HS music and theater students. Dr. Ketterer also demonstrated the development of jazz through different drum grooves. An ISL trio of Seongmin Park, Antonio Del Rio and Richard Penn performed "Take Five" by Paul Desmond and received feedback from Dr. Ketterer. Dr. Ketterer then performed with the students. It was an enlightening experience for all involved.